Many thanks to John Welsh for his excellent work on this video! Next generation sequencing and Y Full analysis of BAM has revealed an interesting development. The Sinclair Herdmanston lineage and our basal subclades Forresters are genetically related. Both groups are L11+ while being negative for downstream subclades U106 or P312. The relation is recent in terms of genetics. ISOGG has not assigned position of this relation on the 2017 haplogroup R phylogenetic tree. Y Full experimental tree v5.01 has identified 17 positions of acceptable quality for pass as matching for Sinclair / Forrester. This cluster has been identified by Y Full as A8062. Contained in this cluster is A8055 which is the current Sinclair designation in FTDNA basal subclades project. Examination of remaining Forrester SNP positions reveals 4 SNP's of acceptable quality which will be downstream of the A8062 cluster. This cluster has been identified as BY11673 by FTDNA. 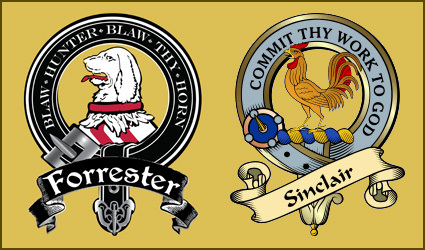 Clan Forrester extends our thanks to Steve St. Clair, and Craig Sinclair, for their work and contributions to this research. Steve has granted permission for link to the Herdmanston Lineage for those who wish to know more. The arms of the Lords Forrester have never been recorded with Lord Lyon King of Arms. This could be due to the fact Sir George Forrester, the 10th Lord Forrester and the 1st Lord Forrester under the new patent died prior to 1672 when register of arms became mandatory. 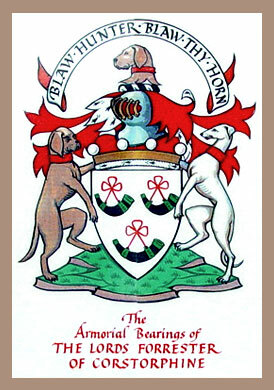 The Foreman [Lyon Office] gives the supporters of Sir Archibald's arms  as a beagle on the dexter side and a greyhound on the sinister. Hence the iconic image of the Lords Forrester. Only Sir Adam Forrester is reported with the sable chevron. This could be a possible clue to heredity as Forester of Northumberland also had the sable chevron. The vert chevron belonged to Sir John Forster after he was honored for his actions in the battle of Acre. Sir John was awarded governor of Northumberland and Bamburgh Castle. There are many variations of Forrester Arms and the preceding examples are just a few. The arms of the father could only be passed without matriculation to the eldest son. No doubt there are examples of Forrester Arms lost to time. Much speculation has been given the orientation of the mouths of the bugle horns as differentiation of the Foresters of Northumberland and Forrester of Scotland. The examples of tomb chests of the Lords in St. John the Baptist in Corstorphine show the mouths of the bugle horns facing both dexter and sinister. There is no record of orientation so we may conclude the bugle horns orientation was a matter of preference from matriculation to matriculation.